This casebook is designed to engage students with a wide range of learning styles and to explore evidence law from the eyes of an advocate. Through a problem-centered approach that focuses on the gray areas of the Federal Rules of Evidence, students will develop a heightened sensitivity to factual and legal arguments that govern the admissibility of evidence. This focus on legal argumentation allows students to actively cultivate an understanding of the legal doctrine behind the Federal Rules of Evidence as well as the role that facts and narrative play in legal reasoning. Exercises, visual aids, and video supplements in each chapter allow students to assess their learning. A single thread that runs through the book is video and case materials surrounding a North Carolina murder trial, State v. Peterson. The trial was memorialized in an award-winning documentary, The Staircase, directed by Jean-Xavier de Lestrade. 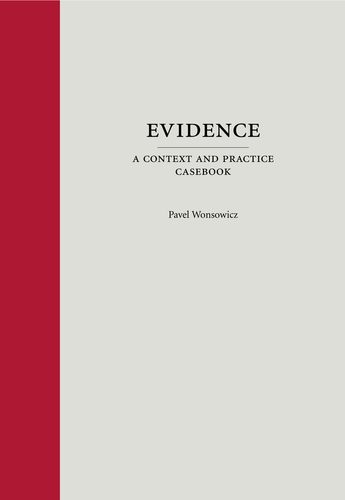 The casebook follows the trial, including the strategies undertaken by counsel and the battles over evidentiary issues that shaped both sides narratives in the trial. Video excerpts will be provided to the instructor to add a further dimension to student learning and to reach a broad array of learning styles. The Teachers Manual will include pedagogical analysis, visual aids related to the text, questions and exercises designed to be used in or out of class, and video excerpts from The Staircase. This book is part of the Context and Practice Series, edited by Michael Hunter Schwartz, Professor of Law and Dean of the University of Arkansas at Little Rock Bowen School of Law.